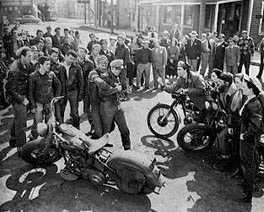 Ever since "The Wild Ones" came out, drivers have had concerns about motorcyclists riding in groups. In 2005 the Malaysian government dealt with the issue of group riding and the public concerns of motorcyclists riding in convoys. That same year Toronto, Canada dealt with some public issues of group riders. This past weekend a motorist found himself into a dangerous confrontation with a group of riders in Harlem, NY, which is now leading to negative sentiment towards riders nationwide. Opinions in the riding community seem varied and heated on both sides of the argument. The Harlem incident was an ugly scene, causing harm to both riders and the motorist. The police presence was heavy in New York City that day with a great deal of focus on motorcyclists due to an unofficial rally coordinated via social media named Hollywood Stuntz. Motorcyclists were coming into the city to participate and being met by law enforcement. News of gratuitous citations, confiscated motorcycles and harassment by law enforcement are starting to surface in the wake of this enormous controversy. Seemingly just being a rider that day in New York City would result in being stopped by law enforcement, due to the NYC Police roadblocks. The entire gang should be jailed and charged with assault immediately. F***ing scourge. Psychos. It's the right move if you're about﻿ to be attacked. If my wife and child were in the car, and if about 70 made me completely stop, and then one attempted to gain access to my car, absolutely I would take the same actions. Riders of all types are anticipating backlashes, especially while group riding. Motorists are commenting throughout social media demanding bans on group riding.